When it comes to the ballot, “wimming at Wimbledon” is not quite so straight-forward. Whilst you can almost guarantee your success in the queue by simply getting up early, entering the ballot doesn’t necessarily yield tickets for Wimbledon. However, it’s the first and most crucial step; as they say, you’ve got to be in it to win it. I recognise that my queue post wasn’t very helpful given Wimbledon is an early-July distant memory. However, this ballot post should hopefully be a lot more useful as the tournament organisers will now be preparing for Wimbledon 2018 which means we, the punter, can also start preparing for Wimbledon 2018! No jokes, the link says it all. Let me talk you through my ballot success for the 2017 Championships. (1) At some point in September, I applied to the ballot directly, following the bureaucratic process that Wimbledon seems to hold dear. Scroll down to Wimbledon on my tickets guide to learn more about what is involved. (2) Not fancying my chances, in November I did my classic shout-out to Facebook in hope I could persuade a few more people to apply to the ballot, so they could take me with them when they won. (3) Distracted by the Australian Open, I forgot all about the ballot until 13 March when I came home after a boring day at work and found a letter addressed to me on the floor. I remember picking it up, casually opening it, thinking it was some fancy looking bill. And then I saw the Wimbledon branding. Gasp. Frantic opening. Ahhhh, I got tickets!!!! Cue texting my sister, the second biggest fan of Wimbledon that I know and waiting very impatiently for a response. Clearly Wimbledon knew it was my year of grand slams! The notification letter that you receive from the tournament provides instructions on how to pay for the tickets online if you want them and so that night, I logged on and paid the balance. I think I was a bit scared that if I didn’t pay for the tickets there and then, somehow they’d be taken away from me. So happy! (4) Having paid for my tickets, the only thing left to do was wait for them to arrive. In a similar context to when I received my original letter, I came home from work on 17 May to a fancy looking envelope and then got very excited when I realised what was inside. Wimbledon tickets!! (5) Fast forward several months to the day itself. Anna and I went for brunch in Wimbledon village in the morning and then strolled into Wimbledon at around 12pm. Such a contrast to the previous Friday when I’d queued! Fortunately, I really enjoy the Wimbledon queue experience so never grudge it, but it was so nice to get into the grounds that Monday and not feel exhausted by the morning’s efforts. And the weather was again on form! Check out the blue skies and sweaty Catmac below as proof. Our line-up on centre court was also not too shabby: Venus Williams, Andy Murray and Roger Federer. You know, just some legends of the sport. As if I need to say, it was another cracking day at Wimbledon. Venus strolled through her match. Andy stressed us out as he likes to do but fought through to win the match. Roger demonstrated the art of effortless tennis. I couldn’t have asked for more. For context, this was the same day that Nadal and Muller had their epic showdown on Court number 1. Looking back, I wish we’d stayed to watch the match on Henman Hill/Murray Mound. Instead, we left the grounds and kept stopping at pubs on our route back to the station, watching snippets on their tiny screens. Facepalm. Moral of the story: never leave the grounds when there is tennis still in play! When Anna and I were at brunch, we got talking to some other lucky ticket holders at the table next to us. They told us that they had won ballot tickets for the mens final in the 2013 championships, i.e. they saw Andy Murray win Wimbledon for the first time, after Britain’s 77-year wait. What an epic event to have witnessed! This conversation, coupled with my own flukey success in my first ever entry to the ballot, has motivated me to apply for the ballot forevermore. And I think you should do the same (and take me, obviously!). Though it wasn’t Andy’s Wimbledon this year, it was probably my most successful Wimbledon yet. Not one visit, but two: one in the queue as a punter, the other as a member of the tennis elite, strolling in after brunch in Wimbledon village, smug with ticket in hand. Following on from my last blog post “So You Want To Go To Wimbledon?”, I thought it could be useful to illustrate my step-by-step guide to queuing at Wimbledon to demonstrate that anyone can”wim” at Wimbledon. I mean, at least in 2018 you can?! Step 1. Wake up at 5am. Take obligatory sunrise photo and post it on Facebook so the world knows you’re going to Wimbledon. Step 2. Meet friends at 6.30am outside Southfields station. Be thankful that you were only 5 minutes late, and not 30 minutes late like you were two years ago. Follow signs and crowds to the start of the queue. Join queue at approximately 7am, receive your queuing card (essential for getting into the grounds) and tweet ViewfromtheQ to let them know the status of the queue (please note, tweeting is not mandatory, it’s just helpful for your fellow Wimbledon fans). Step 3. Enjoy the queue. Take natural photos like the one below. Go for multiple walks. Try a delicious iced coffee from one of the food outlets. Get told you won’t be allowed to take your Scottish flag inside the grounds so hide it in the depths of your backpack. Step 4. But not before you take a group photo with your flags. Step 5. Make slow progress in the queue. Make friends with the people next to you in the queue so they can take group photos for you. Step 6. Pay £25 for a grounds-pass and enter the grounds around 13:05. Take a photo to remember how joyful you felt. Check out the order of play and if interested in the players on Court Number 3 (Oh hi, Nishikori) get yourself in another queue to get a seat. Step 7. Having not been deterred by the length of the Court 3 unreserved seating queue, get on Court Number 3 court and feel extremely pleased with yourself. Watch Nishikori win a set but then ultimately lose. Mixed emotions. Step 8. Get some bargainous strawberries and cream for £2.50 and then some less bargainous Pimms for £7.50, battle through the crowds to find a small space of grass on the hill and sit back and watch the tennis on Murray Mound (Henman Hill). Step 9. From your perch on the hill, watch a third-round battle on Centre Court between Murray and Fognini, realise the match isn’t going to be over in a hurry so join the ticket resale queue and get yourself a cracking seat on Centre Court for £10. Step 10. Scream your way to an Andy victory! So You Want To Go To Wimbledon? A few people have asked me for advice on going to Wimbledon so before the greatest grand slam of the year descends upon us, I wanted to write a quick post explaining all there is to know. Sit down, make yourself a cup of tea, and wish that you had one of my amazing Wimbledon cupcakes. One of the reasons that Wimbledon is so great is the fact that you can get tickets last-minute, either by queuing on the day, or by purchasing online the day before. The majority of the show-court tickets have been allocated through the ballot but a healthy number are kept behind for on-the-day purchasing. If you want a chance of getting these, I suggest you become one of these mad people in tents who camp overnight. Ground-passes (Grounds and unreserved seats on courts 3-19): The majority of people joining the early morning queue will be there to get a ground-pass ticket. These tickets are only sold on the day of play. In past years, I’ve arrived at the grounds between 6.30am and 7am in order to guarantee entry. Follow @ViewFromTheQ on Twitter to get the daily update on what time is advised to arrive. If you rock up at 10am, you’re not getting in. Tickets on the first week of play will be £25. After work: I can’t find anything to confirm this on the Wimbledon website but I think if you go to Wimbledon after 5pm, you can buy a Ground pass for even cheaper than £25. However, I’d only recommend doing this on the first week or the first half of the second week when there are still lots of matches going on. Re-sale tickets. Another reason Wimbledon is so wonderful is because you can buy show-court re-sale tickets which have been handed in by attendees who decide to go home before the action is over. Tickets cost either £5 or £10, and are available from 5pm at the re-sale kiosk. 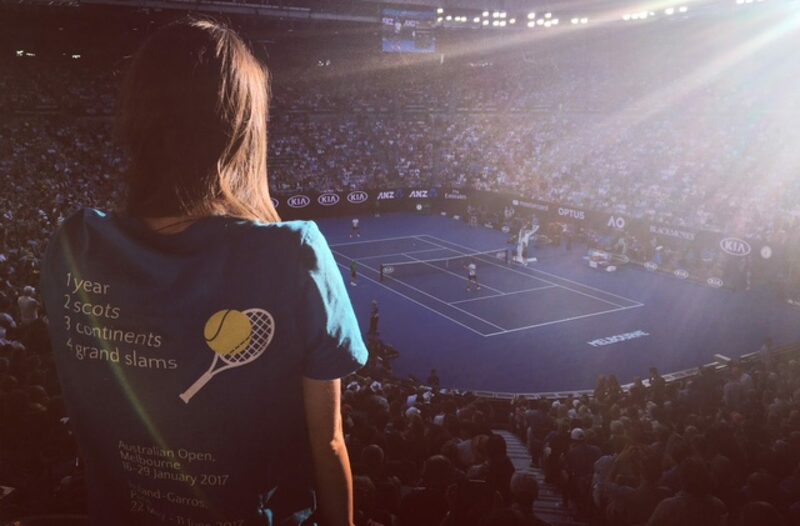 It is also possible to buy show-court tickets on the day before play on ticketmaster – my friends did this last year and saw some epic matches on Centre Court. I’ve never done it but imagine this might cost a small fortune! If you’re in the UK, as ever, Sue Barker and the BBC have you covered so you can bask in the wonders of Wimbledon for the next 2 weeks. If you’re in London, I’d recommend watching some of the matches on one of the big screens dotted around the city for the next best thing to a Henman Hill/Murray Mound Wimbledon atmosphere. Myself? Queuing on Friday. Centre court tickets on the following Monday. And lots and lots of quality time with the BBC on either end! One more sleep until Wimbledon! Bonjour mes parents! C’est votre plus jeune fille préférée qui vous appelle, finally here to tell you all about her recent grand slam adventure à Paris! If this was a real postcard, it would have a British stamp on it, rather than a French stamp, because as per usual, I’ve been quite delayed in actually getting around to writing this and sending it to you. Terribly sorry. Anyway, I don’t want you getting your grand slams confused so before Wimbledon hits our screens, shall we reminisce about Paris? My long weekend in Paris was such a delight. London had been hot that general-election Thursday when I departed, but I arrived to even warmer temperatures in Paris. Can you believe I hadn’t been in Europe proper since 2015? Somehow I’d forgotten that last year I was too busy walking 500 miles. The temperatures, combined with this realisation and the view in front of me, made for a very ecstatic Catmac as I walked out of Gare du Nord into the blinding sunshine. Paris architecture is incredible. ‘Shall I move to Paris?’, I wondered to myself as I slowly wandered south to our Air BnB in Le Marais, an excellent choice might I add. Don’t worry parents, as with Australia, I think it’s unlikely that I’m about to change countries any time soon. Do you remember my old Brussels flatmates Marine and Jo? On my first night in Paris, whilst I was waiting for Viv to arrive, I met up with Marine and as per tradition (well, we’ve done it twice!) we face-timed Jo who is now back in Brussels post-studies. It was so cool to see and laugh with them again! I love that I still have these connections from different stages of my life. My Brussels life is a distant memory to me now, but meeting up with the people I shared the experience with helped me relate to it again. The blog also helps. Rue le Titien pour toujours! Even in central Paris, there seemed to be a lack of activity. We’d been told there was a big screen by the Eiffel Tower so we ventured there for the final. Naturally, this led us to vision our arty Instagram shots-to-be but when we arrived at the screen, we were a bit disappointed. Sure, the Eiffel Tower is in the vicinity but how am I supposed to see it from within this hidden enclosure?! Alas, our instas were not to be, but to be fair, when we did get inside this rather random and exclusive RG watchpoint, we quickly embraced our new lives. Asides from the tennis, and the obligatory parkrun (when in Paris), we still had lots of time to enjoy the city. Shout-out to Viv who got up at 7.30am to go to Versailles whilst I went to parkrun so we would then be able to hang out again in the afternoon after our respective activities! This trip was the first time that I felt like I really understood the geography of Paris. Now I understand that the Eiffel Tower is west, Roland-Garros even more west, etc, etc! It was also the first time that I’d walked extensively in the city and fully appreciated its beauty. Paris, there’s so much I love about you. It’s a good sign that, even only three weeks on, I keep forgetting that I had possibly the worst cold of my year on this trip to Paris. Let’s just block out those negative memories! I remember thinking I’d have to rein in my cheering for Andy because my voice wasn’t strong enough to shout, and then, of course, I threw that plan out the window as soon as Andy came on court. “ALLEZ ANDY!” To be fair, it felt like there were only 10 other Andy fans in the whole stadium – he needed my voice! Ice cream was then, of course, essential to aid my recovery. Amusingly, my grand slam tour has turned into a bit of a Nadal slam tour. I watched him in the final in Australia, and then again in the semi-final in Paris. Is he going to feature in my Wimbledon experience? This wasn’t the plan. But I can’t complain. Even though Andy lost in his semi-final at Roland-Garros, that match was a huge treat for me and made the grand-slam risk of 2017 seem all worth it. Now I hope you’ve both fine-tuned your voices because Andy needs us for the next 2 weeks. Watch out for me/him/two scots at Wimbledon!